Interval training involves high-intensity periods of work followed by lower intensity periods of work or rest that are repeated for a specific number of repetitions, determined by the fitness level of the individual. The rest periods allow for a buffering of lactic acid from the blood and ensure a certain amount of recovery for the next high-intensity interval. The application of these variables is determined by the training goal of the individual, and it is focused on the energy system that is to be challenged. The three energy systems that can be challenged during interval training are ATP-PC (sprints or shorter intervals), anaerobic (moderate distance or time), and aerobic (longer distance or time). It can also be effective to further break down both the anaerobic and aerobic energy production into secondary levels of power and endurance. 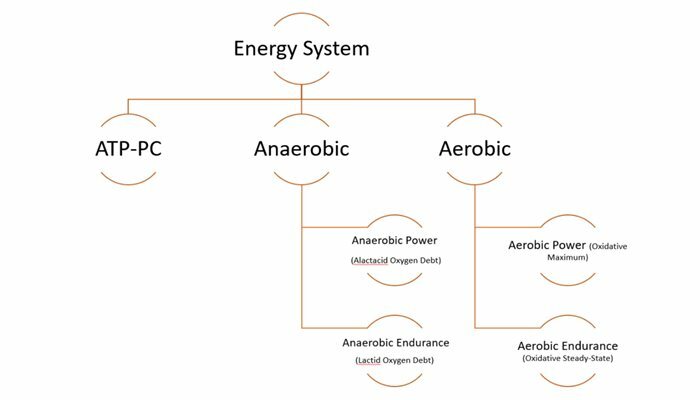 All three energy systems have different workloads and recovery times based on the intensity of the intervals and the time allowed for the buffering of lactic acid and replenishment of ATP so that the following interval can be completed at a high rate of work. Designing interval training can be challenging. There are some clear physiological principles and guidelines, but even these leave significant room for interpretation. Many athletes and coaches experiment within the typical boundaries of training levels or zones by adjusting the length and intensity of the work interval, along with the length of the rest interval. They also experiment by increasing or decreasing the number of sets within an interval workout. Why? Intervals are hard work, and we want to make sure we’re maximizing the return on our painful effort; we want to find the best interval workout possible. The introduction of readable, available power meters in the late 1990s was a game changer for interval design and completion, as it supplied highly accurate data for both prescription and also precise measurement of the effort. Numerous coaches and athletes began using power to try different ways of targeting intervals with the goal of improving the efficacy of the dose-response relationship. This led to the introduction of some new systems that have since evolved over the years. One of the first power-based training targeting systems to emerge was Dr. Andrew Coggan’s Functional Threshold Power (FTP) and its associated training levels. Dr. Coggan designed these to be descriptive of workouts, but coaches quickly saw the benefits of using them to target and prescribe workouts. This system is now typically referred to as the Coggan Classic Levels. They were based on the establishment of a tested FTP with training levels assigned as a percentage of that FTP. This use of percentages created a watts-based range for intensity of efforts in desired training levels while also supplying a recommendation for time/length of intervals in those levels. The Coggan Classic Levels gave excellent guidance to the general design of intervals and interval workouts, helping coaches and athletes target a desired physiological/energy system response. This system provided insight into the key challenges of intervals: intensity and time. Although it is logical to define power-based training levels relative to FTP for predominantly aerobic intensities, this does not make sense at higher intensities and shorter durations of exercise, where factors other than metabolic fitness are the primary determinants of performance. Because of this, in the original system I created, level 6 (Anaerobic Capacity) is defined as simply being higher than level 5, whereas level 7 (Neuromuscular Power) is not linked to FTP at all. While appropriate and correct, these definitions are of somewhat limited use for prescribing the power outputs and durations of intervals intended to increase, such as sprinting ability or resistance to fatigue during very high intensity, unsustainable exercise. The desire to improve upon this system was one of the driving factors behind the development of the Power Duration Curve and the resulting iLevels. 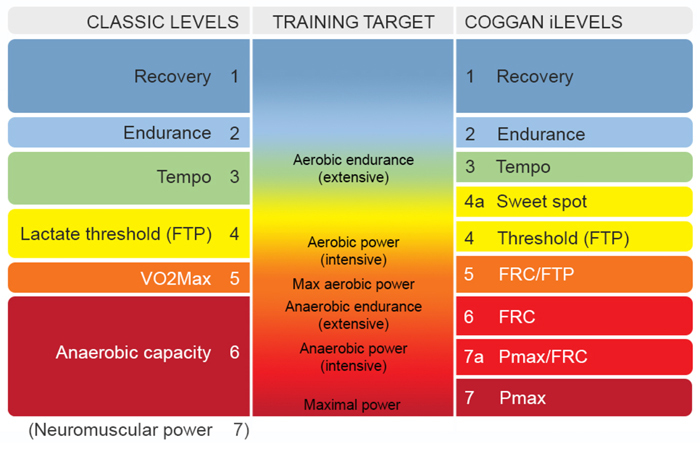 The challenge of the Coggan Classic Levels was one of individualization and dealing with the variation between individuals at higher-intensity training levels (above FTP). This led to the development of Individualized Training Levels, or iLevels for short. iLevels are training levels based on each athlete’s unique physiology and power duration capability, designed to give the coach or athlete even better guidance for targeting intensity and time. This new system was an evolution of the classic seven training levels into nine more specific training levels. These levels were related but allowed not only more individualization but also more specificity in targeting energy systems. iLevels are a perfect blend of the strengths of the classic system and the power of individualization via the WKO4 power duration model. This system supplies individual target intensity and time ranges for training above FTP based on the performing athlete’s actual unique physiology. This new system, as you can see in the example above, supplies not only a more individualized intensity target for efforts over FTP, but also specific time ranges for best results. This evolution gave coaches and athletes actionable intelligence for continuing to improve their design of effective interval workouts. It was a significant advancement that opened the door for even further improvement. Using the power duration curve, we can further break down iLevels into specific time and intensity targets to give the coach or athlete even greater actionable intelligence to identify the optimal interval point and achieve the desired response. Take a look at the report below to understand the output. This system targets a specific point in your unique power-duration relationship that has the greatest “weight” or “exertion” on the targeted energy system. It then uses an intersection system to determine both target time and intensity. 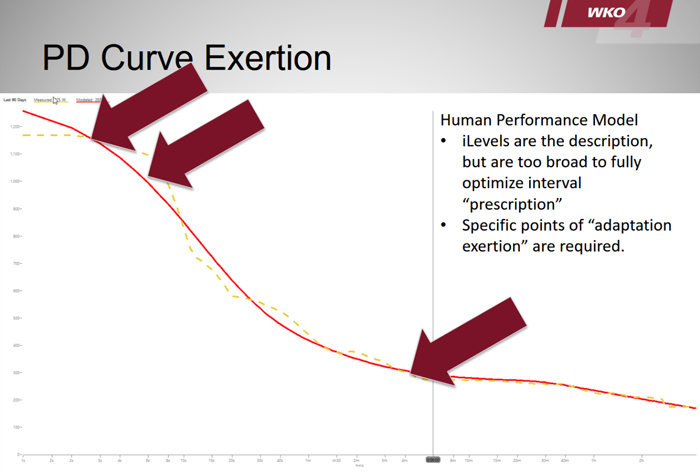 Sets, reps, and recovery are simply suggested at this time, but we are researching ways to further use information from the power duration curve to optimize such information. This is not the perfect interval target, but an optimal one. The time and intensity targets are the optimal target within the iLevel; they help identify the intersection of time and intensity that elicits the highest response based on the power duration curve, which is based on each athlete’s mean max power. Therefore the iLevels system uses actual performance history, the model, and advanced algorithms to supply the estimated point or intersection for the optimal response to training stimuli. First, this is an evolving approach and has a level of specificity that most coaches and athletes are not used to. It is important that we remember these are optimized targets to be utilized as guidance rather than absolutes. Coaches and athletes should explore and test to build confidence. That being said, the time and intensity recommendations are the key points of exertion in the power duration model, and this insight is invaluable and should not be ignored when designing interval workouts. Second, optimized interval targets depend on an accurate power duration model. To ensure accuracy, an athlete must have clean data and a group of maximal efforts that occurred in the last 30-90 days. If an athlete has been just riding along for the last 90 days with no harder efforts, his/her iLevels will likely not be accurate prescription tools. Specificity plays a dual role when building interval workouts. To explain this, let’s create a simple example of Jane Rider. Jane loves to ride the local Wednesday Night Worlds throwdown and can keep up until the group hits one particular hill. This hill is where everyone attacks at max power and separations occur. It isn’t long, and it typically takes her about 90-100 seconds to get over it, but that isn’t enough; she gets left behind by the break. This tells us something about Jane’s training needs: she needs to improve her 90- to 100-second power to make the break. The principle of specificity would suggest that Jane do some 90- to 100-second intervals to improve, but let’s think a little deeper. The short hill is generally a near maximal effort for the duration, and we need to assume that Jane’s anaerobic system is fueling the effort. 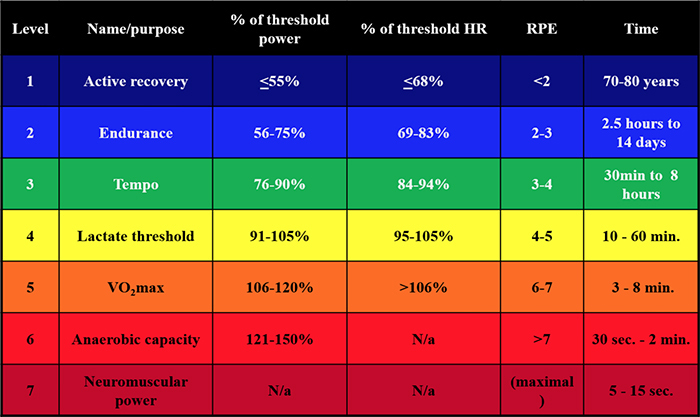 In WKO4, the power duration metric that gives insight into an athlete’s anaerobic capacity (AC) or anaerobic work capacity (AWC) is Functional Reserve Capacity (FRC). FRC measures the total amount of work that can be done during continuous exercise above FTP before fatigue occurs. We could assume that increasing Jane’s FRC would lead to better success on the Wednesday Night Worlds challenge climb. This introduces a second specific need: improving the physiology behind her ability to climb this hill. The optimal time target to increase Jane’s FRC is 45 seconds at 574 watts for extensive FRC building and 27 seconds at 689 watts for intensive FRC building. This is a significantly different demand (or interval) then an interval of 90-100 seconds. She is thus faced with an interval choice: should she focus on the FRC interval (which is shorter and more intense) or should she focus on the specific time demand of the course hill? The answer to Jane’s question is something that a lot of coaches and athletes would have an opinion on, and it is part of the art of coaching. The dilemma is a chicken-or-the-egg situation, but I would suggest targeting the underlying energy system, building FRC to a point of diminishing returns, and then applying that higher FRC to the course-specific hill. This can be thought of as a periodized approach toward an intervals strategy as part of an annual plan. 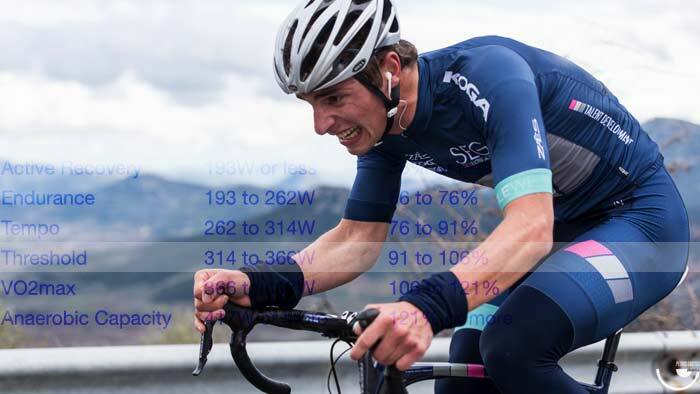 Download a free trial of WKO4 and find your Optimized Intervals.